Reinforced cam thrust covers features a .090" thick wear plate welded into place. 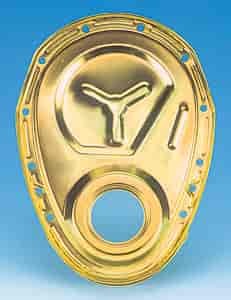 Milodon's Timing Covers are designed to replace leaky, worn and out-dated O.E. timing covers. Each cover is CNC machined for maximum quality and is precision checked for proper placement of seal and dowel pins. These thicker, stronger covers do not need a weld plate, which stiffens the unit to handle more severe loads and provides a positive cam stop. All covers include bolts, thicker water pump gaskets and back plate bolts for additional short water pump clearance. 65555 is rated 4.7 out of 5 by 3. Rated 5 out of 5 by twarne48 from Great quality Made in USA part Bought the chrome foreign made cover and had nothing but problems with leaks. Replaced it with this USA Milodon part and the leaks are gone. I actually like the look of this part better than the cheaper chrome. Rated 5 out of 5 by Budman98 from Nice cover Just as advertised, nice part and fit great. Best deal I could find and delivered fast. Rated 4 out of 5 by Bob977 from Great Fit! I bought this and it fit great and doesn't leak and looks really good. Does this TCC require a &quot;Thick or Thin&quot; front oil pan gasket seal? I have ordered a Milodon oil pan PN# 697-30700 along with a one piece (thick front seal) Fel-Pro oil pan gasket set PN# 375-OS34510T...Thanks! This cover should use the &quot;thick&quot; style front seal.